High school guidance and college counselors are essential in helping students prepare for and succeed at UCF. We’ve compiled the resources you need to help students during their undergraduate admissions journey. Complete the Optional Counselor Recommendation Form online. Attach a letter of recommendation to the printable form and mail it. Mail a letter of recommendation from a teacher. The Office of Undergraduate Admissions can accept official transcripts through U.S. Mail or electronically when sent directly from your institution through a secure delivery service. UCF does not accept PDF transcripts emailed to us directly. NOTE: If the transcript delivery service asks you to provide an email address to send transcripts to, please use myapplicationdocs@ucf.edu. *When sending a transcript through one of the above service providers, their system may indicate that it has been delivered; however, we ask for two to three weeks to process these documents. Instead of sending duplicates, please ask students to verify receipt of the transcript through their application status on myUCF. The redesigned SAT was launched by the College Board in March 2016. UCF accepts both old SAT and redesigned SAT scores. We continuously update our counselor email list. 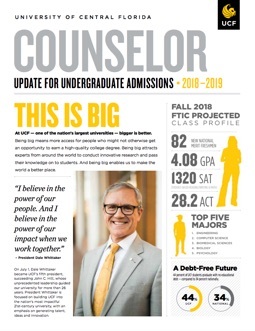 If you are a high school guidance or college counselor and wish to receive the counselor newsletter, please send your name, title, school, mailing address, email address and telephone number to Elizabeth Costello.